Before I started Scandal’s Mistress I had a clear image of the hero. Tall, dark, aloof and kind of grumpy. 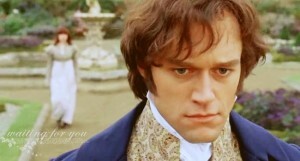 As soon as I saw the BBC’s TV series Lost In Austen, I knew I had the right image of Leo, Lord Warhurst. I don’t always need actual actors or models as inspiration for my characters. In fact, I find it impedes my own creativity instead of helping it because I start to think of my character as being like the character they portrayed in a movie, or perhaps how I perceive the actor to be in real life based on trashy magazine articles. Not that I read trashy magazines. (Cough). I knew nothing about the actor who played Darcy in Lost In Austen and I didn’t want to. The way he portrayed Darcy in the show was exactly how I wanted him to be in Scandal’s Mistress. So you want to know who I’m talking about? If you’ve read Scandal’s Mistress, I’d love to know if you agree with my choice of inspiration. If you’ve watched Lost In Austen, I’d love to know your thoughts on the show and the choice of actor.